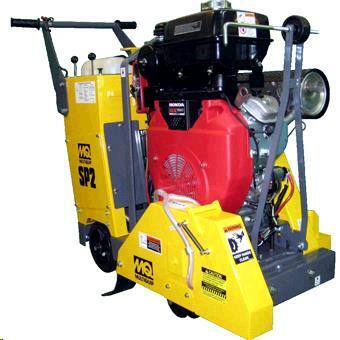 20" Self-Propelled Concrete street saw. Full 7.5" depth of cut. Dependable, powerful 20 hp Honda engine. 2 Gallon unleaded gasoline fuel tank. Right or left hand sawing. Equipped with water hook-up for dust control. 5 gallon portable water tank for wet cutting applications. 20" All-purpose diamond blades are available for an additional cost. * Please call us with any questions about our con floor saw 20 inch s prop 20hp rentals in Oak Grove MO, Blue Springs MO, Independence MO, Lexington MO, Odessa MO, Independence MO and Western Missouri.